Since we heat exclusively with wood and don’t want to purchase wood, we do a lot of cutting and splitting. Bailey wanted to be able to help with this but was afraid that she would hurt herself swinging a splitting maul. Because of this, we decided to get a wood splitter so that she could both help and feel safe. We also figured we would get a lot of use out of it and could even use it to help others in need. 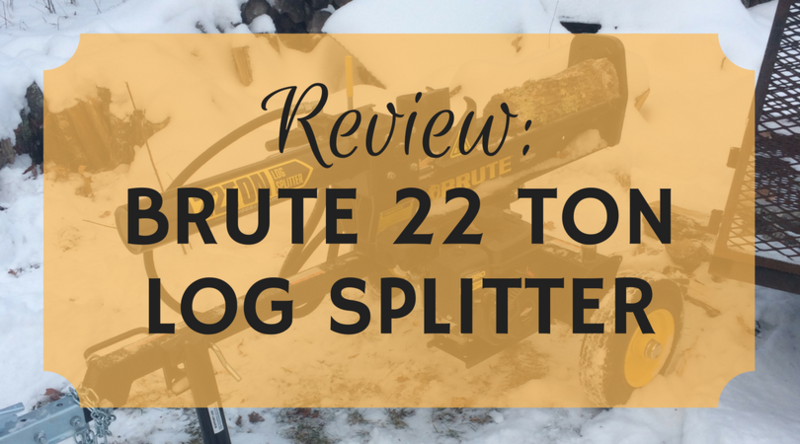 We found what we thought was a good deal on a Brute 22 Ton Log Splitter at our local big box store and after the mail-in rebate paid a little over $500. I would rate this log splitter four out of five stars as it is adequate to meet our needs, but isn’t perfect. 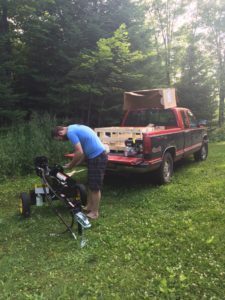 We had the crate loaded into our pickup with a fork lift at the store and opened it in the truck because it is a few hundred pounds. This log splitter came with really good assembly instructions with part numbers that matched the numbers on the blister packaging that the hardware was in. This made it a breeze to assemble because there was no question as to which part the instructions were referencing. Everything went together easily with the exception of one of the wheel bearing covers witch bent a bit when I pounded it on with a rubber mallet. I didn’t time how long it took, but I would guess from opening the crate to starting the engine it was about 2 hours. The motor oil was included, but the hydraulic fluid was not. We haven’t had it long enough to attest to its durability, but after putting two or three cord of wood through it, it has met our expectations. It has split everything we have put in it with no trouble (red oak, sugar maple, aspen and birch up to 18” in diameter). It isn’t quite as fast as I expected it to be (only a little faster than I am with a maul), but that’s okay for us as speed isn’t a priority. What’s more important to us is safety, performance, and reliability. It has met expectations for the first two and so far so good on the third. Other minor hassles have been a few bolts vibrating loose (we should be able to fix that with a little Locktite) and bark getting stuck under the end of the hydraulic cylinder which we use a screwdriver to clean out as needed. Who is this product good for? This is a great wood splitter for us. It meets our needs well despite it not being perfect. I would recommend it to someone splitting wood for their own use, but the slow speed would be enough for me to not recommend it to someone who plans to sell split firewood. The reason for this is in a commercial application speed would be important due to more wood being split and profit per hour to be considered. 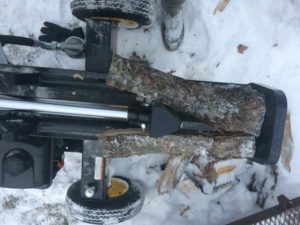 This specific model is only sold at Menard’s, but other log splitters from the same manufacturer can be found at many big box stores or hardware stores across the United States and Canada (check here). We purchased this product and have not been compensated in any way for this review nor will we receive any commission on sales as a result of this review. If this were the case, we would tell you. I’ve been using my son’s splitter since I sold mine a couple years ago when I relocated. I don’t like this one as much as my old one. This has a few design flaws. Engine is mounted too close to the spliting area and logs can fall on the engine. The towing tongue has a needless bolted joint which weakens it. Both ends of the wedge slide tend to accumulate wood chips and need to regularly have them dug out of the track. Original assembly had one hydraulic hose poorly positioned, which I failed to notice, and on first towing the tire wore a hole in the hose which had to be replaced. Hose routing should not allow this to happen. Hi there, I recently purchased a Brute 25 ton unit from Menards. Apparently this unit has been discontinued , but it is basically the same format as the 22 ton unit. I have been happy with the performance, but have been completely unable to find replacement oil and air filters. Have you encountered this problem and found a solution??? We haven’t replaced any filters yet, but I hope we don’t have the same problem.